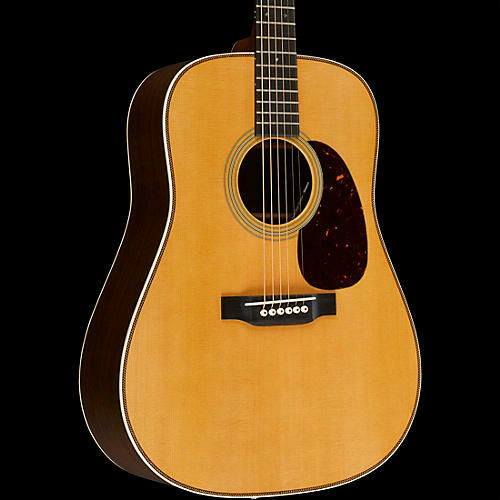 The most popular Vintage Series model, the Vintage Series HD-28VE Dreadnought Acoustic-Electric Guitar is a modern re-creation of the classic herringbone dreadnought with. Channeling legends like Hank Williams, this guitar carries a distinct prestige that can only come from the Vintage Series collection. Bringing it into the modern era is a Fishman's Ellipse Matrix Blend under saddle pickup which combines the world’s best-selling undersaddle pickup, the Fishman Acoustic Matrix, with the popular Ellipse Blend, to give you incredible tone at your fingertips. Its flexible gooseneck condenser microphone, volume, blend and phase controls, make it possible to have the best of both worlds when you play. The sparkling, transparent sound and control that this Acoustic Matrix pickup is complemented by the unique and expressive character of a microphone.